The owners wanted to design apartments that were filled with natural daylight, and common terraces filled with trees and lawns, to help create a home that reflects the harmony of the countryside with the excitement of the city. 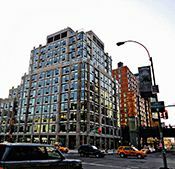 Known locally as TEN23, it has 111 units and is located in New York City, next to Highline Park at 500 West 23rd Street. It has become the world's first large residential project to have LUMIRA® aerogel in its window system. The architects chose Advanced Glazings Ltd. to daylight the building and the company partnered with us to develop a unique solution. The system created uses a combination of glass fiber veils that act as a controlled light diffuser, patented InsolCore™ insulation to eliminate air convection, and LUMIRA aerogel to create a daylighting system with the same insulation value as that of a solid wall. Due to the size of the apartments, it was vital to provide as much valuable daylight as possible. In order to do this, while still complying with the strict New York building regulations for energy efficiency and sound insulation, the architects used Solera® R18 glass units with LUMIRA aerogel to increase the overall insulation value of the project. Consequently, the building was designed so that 34% of all the windows are Solera glass units, which offers a glass insulation U-value of 0.31W/m²K and a sound insulation that exceeds the U.S. outdoor-indoor transmission class (OITC) 36 using a standard construction of 6 millimeters annealed. In comparison to a typical double glazed window that offers U-values of 1.89 to l.42 W/m²K and an OITC in the low 20s, these results are unprecedented in a 6-millimeter glass window. The remaining windows were triple glazed. The combination of LUMIRA aerogel and triple glazed windows ensured that the apartments could have floor-to-ceiling windows admitting the maximum amount of light, while offering superior energy efficiency, excellent sound insulation and building code compliance. In order to meet building code, the south façade of TEN23 required a fire-resistant construction. Rather than build that façade with brick or concrete infill, the architects installed insulated, opaque glass panels with fire-rated systems behind to maintain the scale and pattern of the façade. Where permitted, the architects designed a number of panels with translucent and clear glass to provide privacy and light. The use of LUMIRA aerogel and other environmentally friendly building materials have resulted in TEN23, earning a Silver Award from the U.S. National Green Building Standard. "Using Solera R18 units with LUMIRA aerogel was a very important component of the project," says project architect Michael Fontaine. "The panels have excellent insulation value which enabled us to design very large windows. They diffuse the natural daylight eliminating hot spots and glare and fill the apartments with soft museum quality light. We were also able to exploit the translucent appearance of the LUMIRA aerogel to enhance the exterior design of the building by contrasting clean hi-tech glass sheets against a playful pattern of decagons formed in the adjacent concrete panels." "We were excited to have an opportunity to showcase Solera glass units with LUMIRA aerogel in Ten23," said Avi Bar, vice president of Advanced Glazings Ltd. "Our patented method to stabilize aerogel in our InsolCore™ insulation, meant that the architects finally had a robust solution that allowed for controlled daylighting with unmatched durability and thermal efficiency."